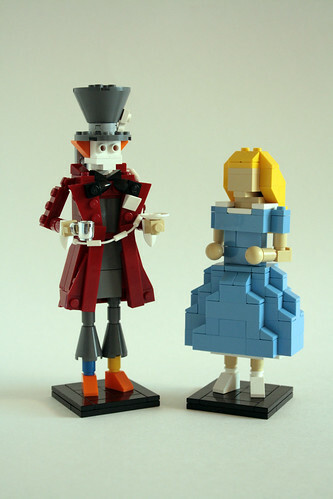 Tommy Williamson’s Miniland scale versions of the Mad Hatter and Alice from Tim Burton’s new Alice in Wonderland immediately caught my eye when I was scrolling through my pictures on Flickr. 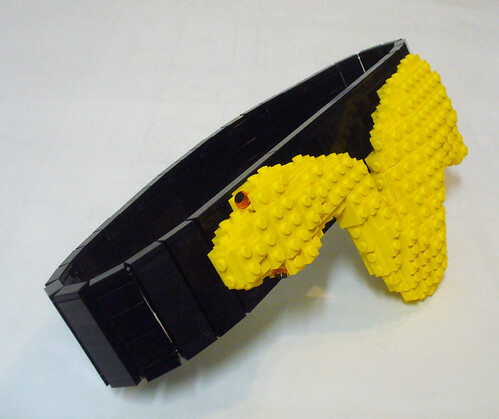 One of the things I’ve been working on this week was a LEGO snake belt buckle. This was one of the more unusual model requests I’ve gotten and it was an interesting challenge. 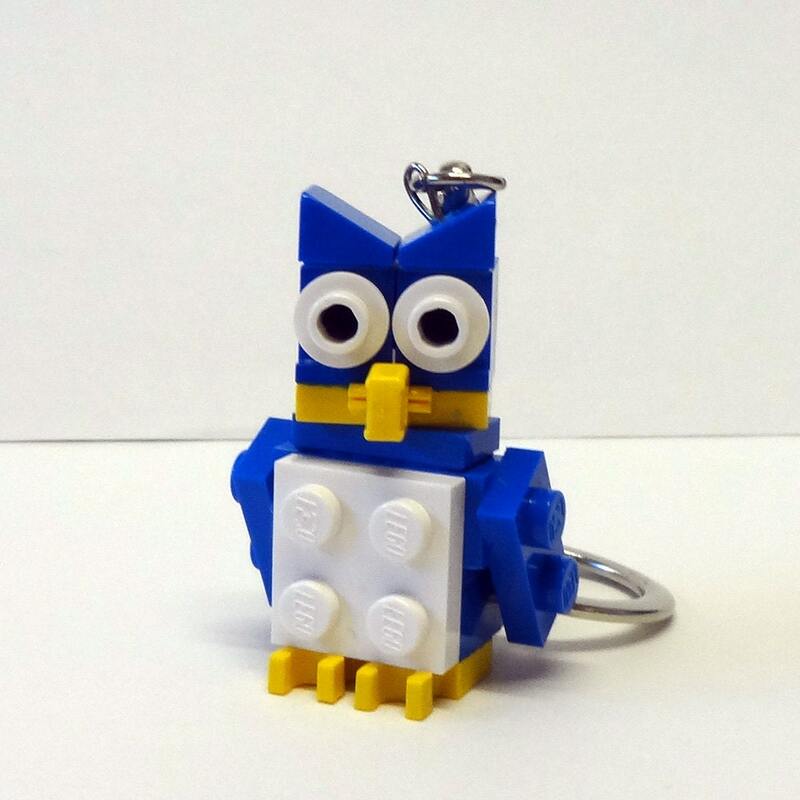 My client asked me to make a LEGO replica of an actual belt buckle. 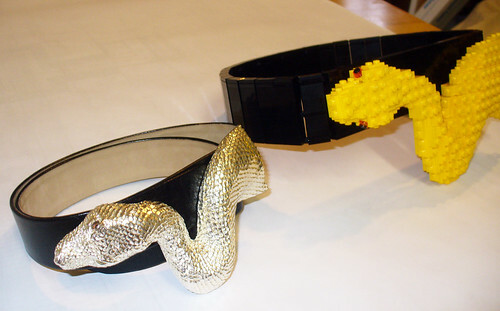 Any sort of organic shape can be difficult, so creating the the look and feel of the real belt buckle including the snake skin and the glass eyes made for a fun build. On the whole the model only took me about a day to design. I’d never made a snake before. Now that I’ve designed it, my brother suggested that I try designing a snake with some sort of snake-like pattern. 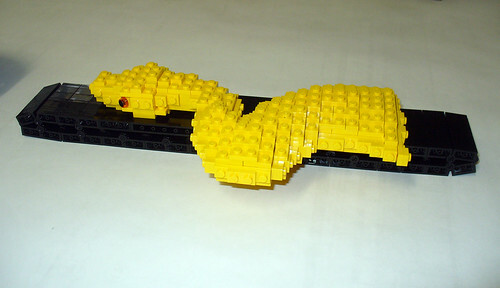 It was tricky enough to make the snake, especially with all the SNOT (studs not on top) that I put into it. 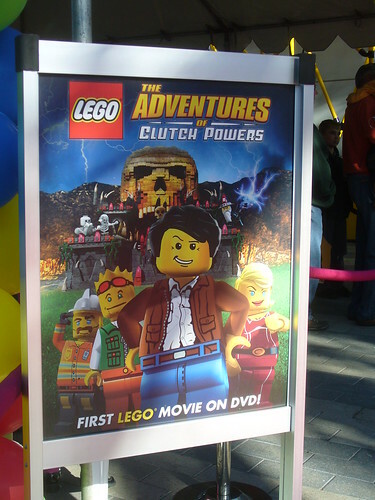 With the excitement of going to the World Premiere of Adventures of Clutch Powers on Saturday I realized today that I didn’t actually review the movie (can you say duh? 😛 ). 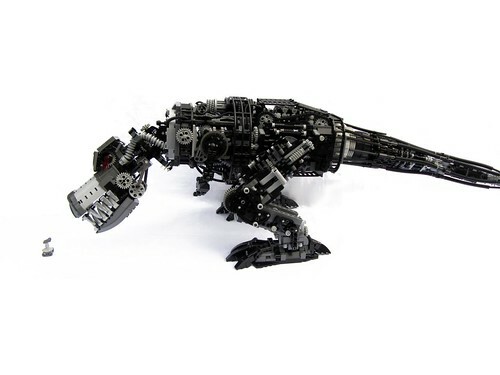 Well as you can probably guess from the above picture, that although Clutch Powers and his team are based in LEGO City (the Theme that is) that end up in a Castle era world. Although I won’t give everything away, I may be giving some of it away so . . . 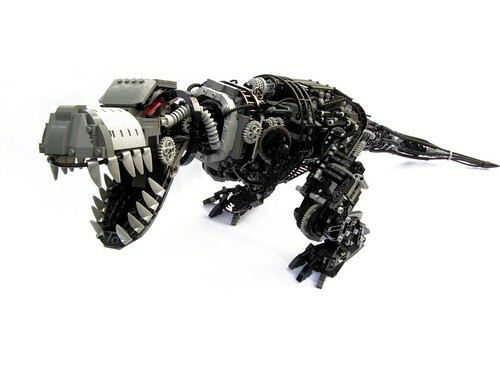 The movie spans four LEGO Themes — Power Miners, City, Space Police, and Castle. Now although this seems like a strange mix, and even I found that the storyline was a bit of a stretch, considering that the movie is basically a 90 minute LEGO commercial for all non-licensed LEGO themes it works (well not completely). I counted about 40 or so actual sets throughout the movie. The movie opens with Clutch “I work alone” Powers down in a mine driving the Thunder Driller (at least I think its that set). He drills into a new area of the cave and happens to find a whole bunch of “power crystals.” While trying to grasp one he runs into what else? A Rock Monster, naturally. After a bit of a scuffle (where you see another Power Miners set get destroyed) with the Rock Monster he happens to escape and get a crystal. Clutch returns to headquarters, after driving through what seems like the whole city. All of the modular buildings except the newest Grand Emporium are in LEGO City along with the Grand Carousel and the newer Town Plan. There is at least two Creator houses that the protagonist zips by more than once in the film. On getting at headquarters Clutch finds out that his boss (I forget his name) decides he needs a team. Although none of them want to work together, they decide they have to. Then they get a distress call from the Space Police prison. Anyhow, back to the movie. So they fly (using the Galactic Enforcer ship) that was “created” by their resident scientist Artie to the Space Prison. Upon arriving and finding no one about they get attacked by the evil wizard Mallock the Malign one of three prisoners (the other two are seen as shadowy cloaked figures behind the wizard). Mallock and his cohorts steal their ship, while destroying the two other ships on the landing pad (two more Space Police sets, big surprise). But since it is a LEGO world the team just builds a new ship. They figure out that Mallock has headed to the medieval planet of Ashlar. This is where I again asked myself “What?” Why would an evil wizard who has magic powers in a “modern” world decide to go back to a medieval planet? Even after watching the whole movie, I was still asking myself this question. The movie definitely is not very big on well thought out story lines. Once Clutch and his team arrive they find out that they have to help the crown prince fight Mallock and his skeleton army. Without making this review too much longer, they end up wining the war and recapturing Mallock to take him back to the Space Police prison. They learn the valuable lesson, after much squabbling throughout the whole movie, that they need to work together and “build on each other” to get the job done. The movie ends with the team getting yet another mission. Can you say sequels? All in all the 90 minutes was a little long for me. I loved the cute characters, but the story was just a tad too strung out and slow in the middle. I can see Power Miners and City going together, and maybe even Space Police, but throwing in Castle (especially as the whole second half of the movie) was just a little much, and not in a good way. 6-10 year-olds will like it. The obvious plot holes, the unlikelihood of the story, and the randomness of it all will make perfect sense to them. 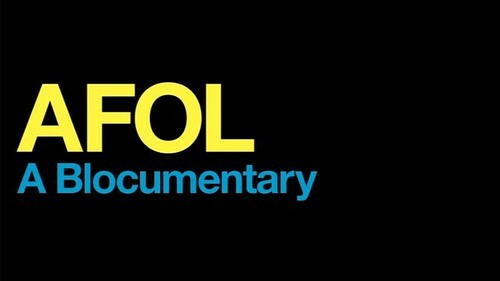 I enjoyed seeing, but I can’t say that I would buy the DVD. LEGOLAND California was seeing stars today. 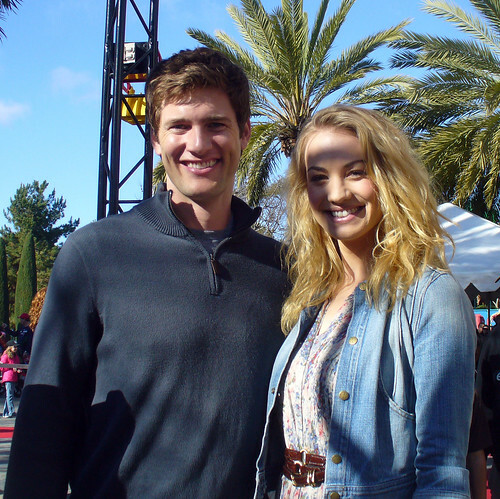 Specifically Ryan McPartlin and Yvonne Strahovski of the NBC TV show Chuck. They are two of the voice actors for the new straight to DVD movie The Adventures of Clutch Powers. 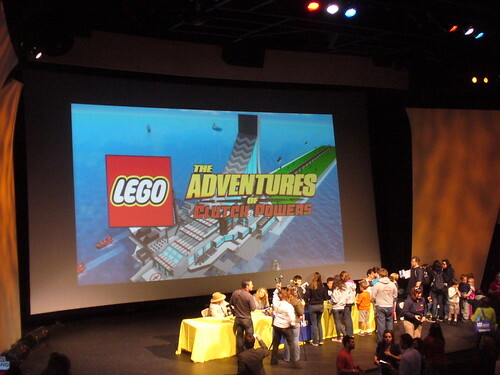 Today was the World Premiere at LEGOLAND California including a walk down the red carpet, a lunch box, and even a LEGO set for every person. Besides all of the people that worked on the movie and media like me many LEGOLAND pass holders who had entered online were chosen randomly to get a chance to see the movie. In fact I got to sit right behind Ryan McPartlin (aka Captain Awesome on Chuck) and his family during the movie. Ryan is really nice and I enjoyed meeting him and Yvonne Strahovski. Actually I got to meet several people involved in the movie including the director Howard Baker and the music composers David and Eric Wurst. Howard Baker was sitting a little bit behind me and he noticed how much I was laughing at certain parts of the movie (I have to admit, I have a loud laugh 😀 ). 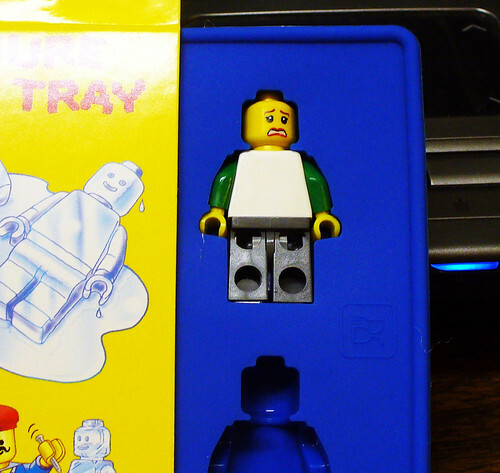 Without giving anything away, there is a nice nod to the LEGO enthusiasts out there which he noticed I really liked. Howard told me that for the scenes where you see LEGO city from the air he was inspired by many of the town layouts that LEGO fans create. I counted around 40 or so real LEGO buildings, cars, and other sets that were used throughout the movie including the Cafe Corner, the Grand Carousel, and the Fire Brigade. 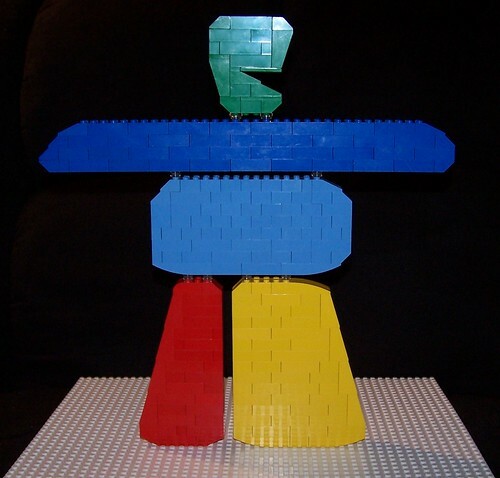 Howard said that he used whatever LEGO sets the LEGO company gave him Maya images of. Clutch Powers is a brand new character from LEGO and is the best builder and explorer in the LEGO universe. In “LEGO: The Adventures of Clutch Powers,” viewers join Clutch on his most dangerous mission yet as he and his team travel from LEGO City to the Space Police prison planet to the medieval world of Ashlar where they must help the rightful heir to the King’s throne find the courage to regain the kingdom from the evil wizard Mallock the Malign. In “A Clutch Powers 4-D Adventure,” Clutch and his team head out on another mission where they are forced to battle with an evil Rock Monster. The movie features amazing 3-D effects combined with wind, water and snow for an action packed and fun 4-D adventure. LEGOLAND California also honored the Dave Thomas Foundation For Adoption today with a $10,000 donation to Wendy’s Wonderful Kids, a program responsible for dramatically increasing adoptions for the more than 150,000 children waiting in North America’s foster care systems. Louis Elguera, the Vice President of Operations for Wendy’s accepted the donation. 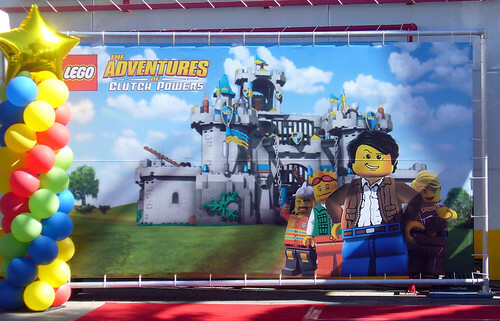 In the U.S. “A Clutch Powers 4-D Adventure” will be playing only at LEGOLAND California and at LEGOLAND Discovery Center Chicago. The movie is included in the cost of admission. The voice actors also sat for signings and photos at the end of the event. I didn’t get in line since I had already gotten to meet them and I wanted all the kids that were in line have a chance. 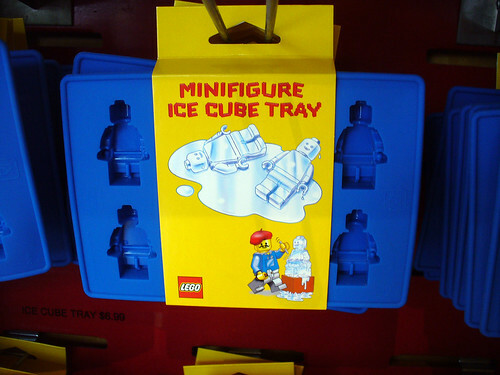 Yes it is a simple design, but so is the original. Great job Janey and good luck to all the Olympic athletes!